"How to Win a War in Space"
Back-up Story: "The Origin of Power Girl"
Day 3: The space heroes are faking their surrender to Lady Styx. Lobo and his space dolphin take Starfire and Animal Man in chains before Lady Styx. Lobo wants his bounty for the prisoners but Lady Styx only has death for him. The dolphin tells Lobo that Lady Styx is saying Lobo is a coward. 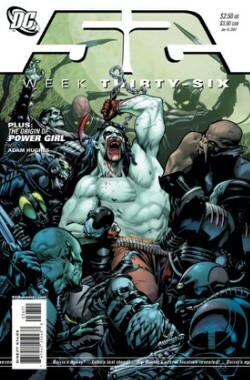 Lobo loses his temper and kills Lady Styx's zombie army. Animal Man tells Lady Styx that he believes in his family. Animal Man signals to Adam Strange who fires his blasters at her. Suddenly the Emerald head bursts in and slams into Lady Styx. They are then consumed by a migrating sun-eater. During the fight, Lady Styx's army shot Animal Man with a necro-toxin. Animal Man dies. Back on Earth, Ellen Baker is hanging clothes on a clothesline. She senses something and a tear comes to her eye. Day 5: At St. Luke's Hospital in Gotham, Renee sits with an ailing Victor (The Question) Sage. Tot keeps sending flowers from Nanda Parbat in the hopes they'll be able to help Sage but they cannot survive outside of Nanda Parbat. Renee realizes that, if she takes Victor back to Nanda Parbat, he may not die. If the journey doesn't kill them both. Day 6: Kathy Kane has arranged for her jet to take Renee and Victor back to Nanda Parbat, or at least as close as a plane can take them. Kathy tries to talk Renee out of the trip fearing for their safety. Renee feels there's nothing to lose in trying given Sage is dying anyway. She feels she has to try because Sage saved her from self-pity and despair. Meanwhile, in Kahndaq, Osiris is depressed over his recent actions. He thinks everyone hates him. Sobek tells him he doesn't hate him. Day 7: Rip Hunter, Time Master, is building some kind of contraption in a technologically advanced city. Supernova is with him. Supernova brought him the staffs of the Starmen, Lex Luthor's Kryptonite gauntlet, the Shadow Thief's Dimensiometer, and more. Hunter is unable to put the devices together into something workable and angrily throws Luthor's gauntlet. Supernova tells him to calm down. Hunter apologizes. Hunter is afraid of what happens if "he" finds them before they're ready. Supernova tells him that Skeets may be looking for them but that he probably doesn't know where they are let alone that where they are even exists: and where they are is the bottled city of Kandor in Superman's Fortress of Solitude. But Skeets appears to be floating outside the bottled city. Power Girl is the Earth 2 Superman's cousin. Clear enough? Oh and get your 52 action figures coming soon from DC Direct. Story - 3: I haven't been enjoying the space story at all so I wasn't particularly happy to see that part of this storyline's big pay-off is taking place in an issue I'm reviewing. This issue did little to change my opinion of the space story. It seemed everyone and their dog knew Animal Man wasn't going to make it back from the space trip so the death itself wasn't exactly a shocker. It was more surprising how cavalierly his death was handled. The writers don't create any sense of true jeopardy for our heroes - they're too concerned with the overly long scene with Lobo finally showing his true colors. Buddy Baker deserved a death that really mattered, a death that propelled the story forward in some way or made him a martyr to his fellow lost-in-space heroes' survival. According to a friend of mine who reads "Omega Men", the events of this issue of "52" notwithstanding, Lady Styx survives into the DCU one year later which further takes emotional resonance away from Buddy's death. The return of Kandor adds to this issue's overall rating - but it detracts from it as well. My immediate Superman fanboy reaction to seeing Kandor factor into the story was diluted by my realization that I wasn't sure what this Kandor's story is. In the Silver Age, of course, Kandor was a Kryptonian city stolen, miniaturized and bottled by space villain Brainiac, which ultimately was recovered by Superman and kept by him in his Fortress of Solitude. Over the past decade or so since Kandor was reintroduced into modern continuity, it's been an alien city not truly in a bottle but in a tesseract and, most recently, it's been a Kryptonian city populated by non-Kryptonians that was apparently stolen by Brainiac but somehow acquired by an alien named Tolos. Some of this history is summarized in greater detail here. Who knows what other changes to Kandor's history may have taken place as a result of the "Infinite Crisis". I'm also curious where the bottled city of Kandor is - it appears to be in Superman's crystal Fortress of Solitude. Except Supes doesn't get the crystal Fortress until the events of "Up, Up and Away" which occur One Year Later. At this time, Superman's Fortress would still be in South America. Something tells me that Rip Hunter's time-travel-related activities in Kandor may be what caused 100 years to pass inside Kandor as is revealed in issues of "Supergirl" immediately One Year Later. Overall, this issue felt very cramped which made the decision to devote a page to Osiris and Sobek questionable given any of the other stories - Montoya, the space heroes, or Rip and Supernova - could have used that additional page. This wasn't a bad issue - it just wasn't the home-run I thought last week's issue was. Art - 4: I like the art and the artist. I just think he's been given two issues of material he's needed to find a way to squeeze into one issue. I really enjoyed the last page spread of Kandor sitting in the Fortress with Skeets hovering ominously outside. Backup Story - 3: Multiversal? That sounds made up. Well it's not in the dictionary but there is a non-profit devoted to investigation of Multiverse theory called the Multiversal Journeys. Presumably, therefore, multiversal means "about, of, or from the Multiverse." So for once, I will give Mr. Waid props for introducing me to a new word. Whoever laid out the issue by breaking this two page story up with an advertisement should be publicly chastised or ret-conned out of existence. Art - 4: Hughes is THE Power Girl artist. One problem prevents the art from scoring a perfect five out of five though: the panel with the Earth 1 Superman and Supergirl holding Power Girl to prevent her from crossing over to another dimension with her cousin, the Earth 2 Golden Age Superman. This didn't happen during either Crisis '86 or Crisis '06 - though I guess you could say it's evocative of what actually happened. Cover Art - 3: I showed the cover to a friend who only knows the DC Universe through the animated universe and asked him if he knew who the white-skinned character was. He knew Lobo from "Superman: The Animated Series" and "Justice League" but he didn't recognize him. When I told him it was Lobo, he looked at me like I was lying and said "Lobo's a vampire?" I think that sums things up.